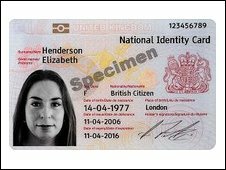 London is about to see the roll-out of the latest stage of the government's identity card scheme. All 16 to 24-year-olds in the city will be invited to carry a voluntary card, which will cost them £30. They can be used in place of a passport while travelling within Europe, but not outside, and can also be used as proof of age and identity in shops and bars. A voluntary scheme for British citizens was introduced in Greater Manchester in November - so far 3,500 have signed up. The government has already begun to issue the first compulsory ID cards to foreign nationals. By 2014/2015 some 90% of all foreign nationals across the country will have been issued with an identity card. London is at the forefront of the trials due to the large amount of foreign nationals living in the city. With about one million non-EU residents, approximately one in seven Londoners will be forced to carry a card. Peter Fawcett, 21, will be the first person to get a National Identity Card in London. He told the Politics Show London: "I'd looked at other ways of getting identity cards, getting a provisional licence, that's more expensive and really this is the cheapest option for me. "I can put this identity card in my wallet, which is really good. If you lose your passport it is so much more expensive to replace." Isabella Sankey, director of policy at Liberty, disagrees. She told the Politics Show London: "There are far better ways to prove your age than by becoming a guinea pig in the government's disastrous identity experiment. "It's a cheap shot to target the young with crude enticements, but savvy multi-cultural London will reject this divisive and unnecessary scheme." At the core of this debate is the National Identity Register (NIR), the database that will hold the information. In its scope and the amount of information held, it will be unlike any other system in the world. The NIR is designed to be up and running by 2011/12 and the information will be collected from people when they next renew their passports, including biometric and traditional information. In the end the difference between a passport and ID card will be slim. People will be able to travel to Europe on an ID card. The NIR will be accessible by up to an estimated 200 government bodies and 40,000 private sector organisations, although mostly only with an individual's prior consent. The cost of the entire scheme for the next 10 years is put at £4.7bn. Of this only about 10% will go on the cards. Some 20% will go on the National Identity Register and the remainder is to upgrade the passport to include biometrics, replace existing applications and enrolment systems and the passport database. One London School of Economics study in 2005 put the cost of the scheme at between £10bn and £19bn.